We already discussed discerning the blood of Christ and how important that is in our walk with God. Equally important, but not as widely accepted is understanding the broken body of Christ. At the last supper, Jesus is talking to His disciples and He hands them the cup of wine. Their Lord tells them that it is His blood and to drink every drop. Then He hands them some flatbread and rips off a chunk, passing it around and says that it is His body. What is Jesus telling these men? 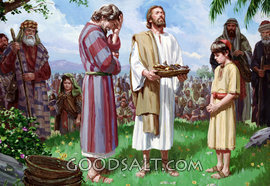 Has He changed the wine and bread into flesh and blood as He changed the water into wine at the wedding feast? No. He is using an object lesson, one of many. The wine is representing the blood that He will soon be pouring out on Calvary. The bread represents His body, soon to be ripped to shreds by a cat o’ nine tails, and pierced by thorns, spear, and spikes. When they see the blood flowing from that cross, and see His once whole skin, marred and broken, He wants them to remember His words that He shared with them that night. He wants them to remember that He did it for them. It is easy for most of us Christians to accept that Jesus died in our place, if we hadn’t we wouldn’t call ourselves followers of Jesus. We have accepted that God loved us so much that He sent His only son and that Jesus loved us so much that He willingly laid down His life so that we can live free from sin and shame. However, for a lot of Christians it is hard to accept that there is more to Salvation than just a get out of Hell free card. Salvation isn’t “fire insurance”. More was done on that cross than most of us realize. Salvation is a package that has many gifts inside. We have been washed clean and forgiven for all of our sins. We have received a new heart and a new spirit. Our family is now a heavenly one, and our Father is God. There are too many promises and scriptures, for one small devotion, to name them all. In a nutshell salvation means we are saved, delivered, and healed. Look the word up. It includes an abundant life. 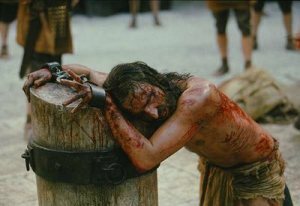 Specifically we see in I Peter that His wounds, those stripes left by the Roman whip, the nails, the thorns, that spear thrust all were for a purpose that transcends a torturous death. He submitted to those wounds so that we could be healed. I know, it doesn’t make sense with our natural mind, but not much in the Kingdom of Heaven does, but it is Truth. God said it and He never lies. Reading I Corinthians 11 in the light of I Peter 2 reveals much about discerning the blood of Christ. Read this again, “That is why many among you are weak and sick, and a number of you have fallen asleep.” Why are we sick and why do so many of us die before our time? Because we don’t understand that our healing has already been purchased. We aren’t waiting to be healed, begging to be healed, just suffering through until God decides to do something. No, He already did! We believe it, tell the Devil, command our bodies to line up with it, and stand in faith; we walk out the promise of God. It is easier said than done. I know. Over fourteen years I suffered with anxiety and Irritable Bowel Syndrome. Praise God, I don’t anymore. In fact I hardly ever even think about it or remember those hard times anymore. We have to get this into our hearts. How can we take ground when we are spending all our time trying to defend our own little area? God’s people need to walk in their authority. Us. Me. You. It takes practice. It takes courage, but don’t fret, the Joy of the Lord is your strength. When we start to get this and we see results, talk about faith rising up in you. And suddenly you have another testimony, another opportunity to share how good God is. At the risk of sounding redundant, read your Bible. Do a search healing, health, and the Body of Christ. We are His body. How can the body of Jesus be sick? How can His body be weak? God does not send sickness; He doesn’t cause birth defects, mental defects, or mental illness. All disease (the state of being not at ease) is from the enemy who comes to steal, kill, and destroy. God gives us life and life more abundantly. Stand on that. Rebuke the Devil soundly and remind Him that you have been blood bought. He took those stripes, He poured out His blood, and He did it all willingly. Don’t ever let it be for nothing. Take hold of that love and hang on with all you’ve got. Live from Heaven! We have decided, my husband and I, to downsize and simplify our lives. We are determined to live with less and to have more time to enjoy this life that has been given to us. We are content with what we have and where we are, knowing that God is bringing change into our lives. We are passing through one season onto another. I have been sorting through years worth of accumulation, donating, selling, trashing and giving away some stuff. I also have been doing some research and study, along with my prayers and conversations with God about it all. During this time I picked up a book about downsizing written by a Christian. Right away I got into the book. The author voices some of the same concerns that we had had about life being too busy and about things more than people. Then somewhere past halfway he says that God gives us “just enough”, giving the Manna in the wilderness as an example. That’s where he lost me. Sure I know about the Manna. God gave them just enough, left overs rotted and got worms, He warned them, but they had to test it themselves. God tells us to be content in whatever state we are in, true (Phil 4:11). But what did Jesus show us by His example? Was he preaching the message of “just enough?” No, He said, “ The thief comes only in order to steal and kill and destroy. I came that they may have and enjoy life, and have it in abundance (to the full, till it overflows).” (John 10:10 Amp). He fed thousands, twice. One time they gathered up seven baskets of left-overs and another time twelve baskets. “ When they had all had enough to eat, he said to his disciples, “Gather the pieces that are left over. Let nothing be wasted.” So they gathered them and filled twelve baskets with the pieces of the five barley loaves left over by those who had eaten.” (John 6:12-13). Another time He called to His fisherman-disciples asking if they had caught any fish. At their answer of “no,” He instructed them to cast in the net one last time, to their astonishment there were so many fish, more than a normal nights catch, that it almost sank the boat! Now that doesn’t sound like “just enough” to me. So right now do you have “just enough” or maybe not even that much? Look at your priorities, look at your choices. Are you giving to God of your time, money and resources? Or are you like so many of us who have been caught up in life here on earth and just trying to get by? Sometimes we get just enough because of our stubbornness and lack of faith, but remember that isn’t His will for us. His will is and always has been, and forever will be to give us everything He has. Period.